62 | TH E M R EP O RT O R I G I NAT I O N S E R V I C I N G A NA LY T I C S S E C O N DA R Y M A R K E T SECONDARY MARKET THE LATEST Ex-Fannie Mae Chief Mudd Settles with SEC Admitting no wrongdoing, former Fannie CEO Daniel Mudd agreed to pay $100,000 to settle SEC allegations of subprime mortgage fraud. F ormer Fannie Mae CEO Daniel Mudd and the Securities and Exchange Commission (SEC) reached a $100,000 settlement over allegations of subprime mortgage fraud that the SEC filed nearly five years ago, ac - cording to media reports. Mudd, who was the CEO at Fannie Mae from 2005 to 2008, is one of six former GSE execu - tives (three each from Fannie Mae and Freddie Mac) the SEC sued in December 2011, claiming they misrepresented to investors the amount of exposure to subprime loans the GSEs had incurred. The Commission's lawsuit alleged that during the years 2007 and 2008, im - mediately before the crisis, Fannie Mae executives said their exposure to subprime and riskier mortgage loans was about $4.8 billion when it was about 10 times greater. "I appreciate Fannie Mae and the current leadership of the SEC stepping in to end a case that should have never been brought," Mudd said of the settlement, according to Reuters. As part of the settlement, Mudd admitted no wrongdoing. While the settlement was relatively small compared to the bil - lions in loans that were in question, Mudd's attorneys still said it was too much. 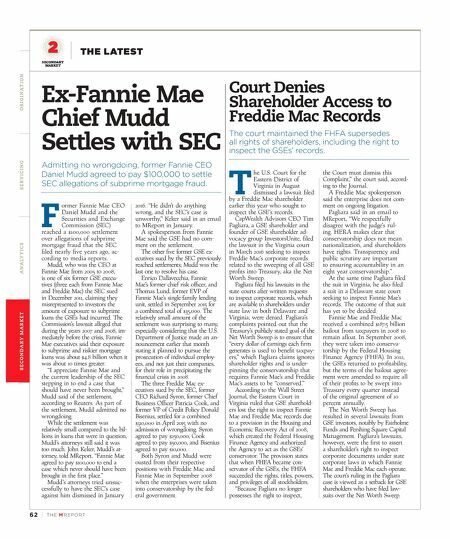 John Keker, Mudd's at- torney, told MReport, "Fannie Mae agreed to pay $100,000 to end a case which never should have been brought in the first place." Mudd's attorneys tried unsuc - cessfully to have the SEC's case against him dismissed in January 2016. "He didn't do anything wrong, and the SEC's case is unworthy," Keker said in an email to MReport in January. A spokesperson from Fannie Mae said the GSE had no com - ment on the settlement. The other five former GSE ex- ecutives sued by the SEC previously reached settlements; Mudd was the last one to resolve his case. Enrico Dallavecchia, Fannie Mae's former chief risk officer, and Thomas Lund, former EVP of Fannie Mae's single-family lending unit, settled in September 2015 for a combined total of $35,000. The relatively small amount of the settlement was surprising to many, especially considering that the U.S. Department of Justice made an an - nouncement earlier that month stating it planned to pursue the prosecution of individual employ- ees, and not just their companies, for their role in precipitating the financial crisis in 2008. The three Freddie Mac ex - ecutives sued by the SEC, former CEO Richard Syron, former Chief Business Officer Patricia Cook, and former VP of Credit Policy Donald Bisenius, settled for a combined $310,000 in April 2015 with no admission of wrongdoing. Syron agreed to pay $250,000, Cook agreed to pay $50,000, and Bisenius agreed to pay $10,000. Both Syron and Mudd were ousted from their respective positions with Freddie Mac and Fannie Mae in September 2008 when the enterprises were taken into conservatorship by the fed - eral government. Court Denies Shareholder Access to Freddie Mac Records The court maintained the FHFA supersedes all rights of shareholders, including the right to inspect the GSEs' records. T he U.S. Court for the Eastern District of Virginia in August dismissed a lawsuit filed by a Freddie Mac shareholder earlier this year who sought to inspect the GSE's records. 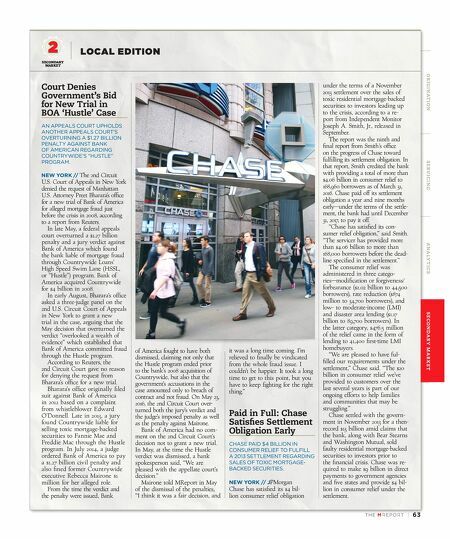 CapWealth Advisors CEO Tim Pagliara, a GSE shareholder and founder of GSE shareholder ad - vocacy group InvestorsUnite, filed the lawsuit in the Virginia court in March 2016 seeking to inspect Freddie Mac's corporate records related to the sweeping of all GSE profits into Treasury, aka the Net Worth Sweep. Pagliara filed his lawsuits in the state courts after written requests to inspect corporate records, which are available to shareholders under state law in both Delaware and Virginia, were denied. Pagliara's complaints pointed out that the Treasury's publicly stated goal of the Net Worth Sweep is to ensure that "every dollar of earnings each firm generates is used to benefit taxpay - ers," which Pagliara claims ignores shareholder rights and is under- pinning the conservatorship that requires Fannie Mae's and Freddie Mac's assets to be "conserved." According to the Wall Street Journal, the Eastern Court in Virginia ruled that GSE sharehold - ers lost the right to inspect Fannie Mae and Freddie Mac records due to a provision in the Housing and Economic Recovery Act of 2008, which created the Federal Housing Finance Agency and authorized the Agency to act as the GSEs' conservator. The provision states that when FHFA became con - servator of the GSEs, the FHFA succeeded the rights, titles, powers, and privileges of all stockholders. "Because Pagliara no longer possesses the right to inspect, the Court must dismiss this Complaint," the court said, accord - ing to the Journal. A Freddie Mac spokesperson said the enterprise does not com- ment on ongoing litigation. Pagliara said in an email to MReport, "We respectfully disagree with the judge's rul - ing. HERA makes clear that conservatorship does not mean nationalization, and shareholders have rights. Transparency and public scrutiny are important to ensuring accountability in an eight year conservatorship." At the same time Pagliara filed the suit in Virginia, he also filed a suit in a Delaware state court seeking to inspect Fannie Mae's records. The outcome of that suit has yet to be decided. Fannie Mae and Freddie Mac received a combined $187.5 billion bailout from taxpayers in 2008 to remain afloat. In September 2008, they were taken into conserva - torship by the Federal Housing Finance Agency (FHFA). In 2012, the GSEs returned to profitability, but the terms of the bailout agree - ment were amended to require all of their profits to be swept into Treasury every quarter instead of the original agreement of 10 percent annually. The Net Worth Sweep has resulted in several lawsuits from GSE investors, notably by Fairholme Funds and Pershing Square Capital Management. Pagliara's lawsuits, however, were the first to assert a shareholder's right to inspect corporate documents under state corporate laws in which Fannie Mae and Freddie Mac each operate. The court's ruling in the Pagliara case is viewed as a setback for GSE shareholders who have filed law - suits over the Net Worth Sweep.